The LT Series wireless transceiver is ideal for the low-cost, bi-directional wireless transfer of serial data, control, and command information in the favorable 260 to 470MHz band. Thanks to an advanced, synthesized architecture, this RF transceiver can form a reliable wireless link capable of transferring data at rates of up to 10,000bps over distances of up to 3,000 feet (1,000m). The LT Series is a single channel On-Off Key (OOK) RF transceiver only. There is no processor or protocol embedded inside the module, so no configuration or programming is required. This transceiver module is just the radio, so all protocol functions are handled outside the module. This allows the designer to create a system that is specifically tuned for the application, with no extra overhead, power consumption or cost above what is absolutely necessary. The wireless transceiver is capable of generating +10dBm into a 50-ohm load and achieves an outstanding typical sensitivity of -112dBm. The modules operate over a 2.1 to 3.6VDC range and feature very low power consumption, a wide operational temperature range, adjustable transmitter power, and RSSI output. 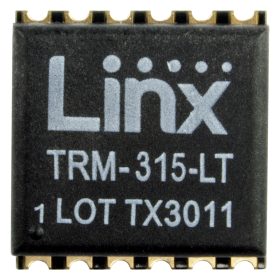 As with all Linx RF modules, no external RF components are required (except an antenna), which allows rapid integration, even by engineers without previous RF design experience. The LT Series is compatible with the LR Series transmitter and receiver, so mixed systems are possible. This allows for systems with transmit-only or receive-only devices to use the lower cost LR Series while more complicated base-stations use the transceiver. These RoHS-compliant modules are housed in a tiny SMD package that are well-suited to both prototyping and high-volume production.